Catnip, it’s not just for cats! It’s easy to grow your own too! Do all cats love catnip? As a matter of fact, no. Sensitivity is genetically controlled so not every cat will feel the effects. It is commonly thought that 10-30% show no interest at all as they did not get the “catnip gene.” In general, kittens are not affected until they are three months old. Wanting to grow your own? The seeds have a rather poor germination rate, so plant lots! Also plant them away from your house or every cat in town will be loitering and rolling around crushing the plants! Some parts of the US produce very good catnip and other parts produce catnip that’s not so potent – it’s all about soil and weather. All of the cats at my house enjoy catnip to varying degrees. I have to admit that I am a bit of a “nip head” and am a little down if I don’t get my daily dose. I positively adore it! Fortunately it is nontoxic and non-habit forming. We cats know when we’ve had enough. Some people don’t want to give catnip to their cats because the crazy behavior makes them uncomfortable. However, a little catnip can encourage play (especially in older cats), elevate moods and ultimately act as a mild sedative facilitating the all-important ritual of cat napping. A little loose catnip on the scratching post can also encourage proper manners around furniture. Cat Faeries Legendary Catnip Toys are my favorite way to enjoy catnip. The catnip is wildcrafted from catnip which grows in a secret place in the US where, due to soil and weather conditions, the level of nepetalactone is the highest on the planet! The smell is irresistible right through the box and the toys are adorable and are very durable. I know mine get a lot of use. Of course, if you’re not a cat you may prefer a soothing cup of catnip tea while you watch Kitty enjoys her new toys. Just keep in mind that a big cup of catnip tea can cause you to doze off to slumberland! Catnip has some surprising health benefits for people including: sleep aid, menstrual cramp killer, hot flash cool down, and upset tummy settler! For cats it’s great for their immune system. Do cats feel love? Do we get a hormonal boost from loving cats? When someone I was buying greens from at the farmers market wished me Happy Mother’s Day, she put a caveat on it and said “That is IF you are a mother.” Not one to let poor manners slide I very kindly told her “I’m a mother to 4 cats, 4 bunnies, a business, and I’m motherly to countless people including my husband, and my customers.” While her reaction was not positive, she gave me the stink eye, I’m hoping that if she thought about it later in the day and that she might have changed her closed minded thinking. After that encounter a fascinating National Geographic article crossed my path about the feel good hormone, Oxytocin, which increases significantly when someone gives birth and takes the newborn into her arms and gazes at her child. The article goes on to tell us that a grandmother will get a similar Oxytocin increase when she sees her grandchild for the first time. And just as exciting, men are absolutely capable of this hormone being released, it takes them a bit longer but it’s a comparable rise as well. Also fascinating is that transgender people in various stages of their transition will get the same increase of Oxytocin with their babies. These numbers were gathered when tests were done before and after contact with the baby was made. This had me wondering – does the Oxytocin hormone increase in us when we hold or look into the eyes of our cats or other animals? I consulted with good old Dr. Google and found articles about what happens to us when we gaze into the eyes of an animal, any animal, and yes, Oxytocin kicks in when we gaze into the eyes of a cat just as it does for a woman who’s given birth! I know you are thinking “Of course, I could have told you that!” but now we know that it’s not just us crazy cat ladies and crazy cat gents who think so, science confirms it – it’s for real! Our cats give us the Oxytocin feel good hormone, and anything that feels good is healthy and live extending, and we are all about that! How to use words to change your cat’s behavior. Words, powerful and important – words. We say them. We think them. Science, religious leaders, philosophers, and metaphysicians have proven that words and phrases can imprint themselves on our brains, cells, and bodies and affect them in both positive and negative ways. This extends to other people and animals who hear our words or to whom our thoughts are directed. Ponder this a bit before reading more – your words and thoughts are powerful for both good and not so good. Water is particularly sensitive to imprinting, interestingly even lifeless fluids like soda can be influenced by spoken words and thoughts which can have those thoughts and wishes imprinted upon them. Imprinting can also affect foods with a high water content like lettuce or canned cat food. And guess what? People and cats being mostly water we are all sponges for words and thoughts! Note: the exception to flowery speech is when you need to be completely honest with your veterinarian! What I’m talking about day-to-day thoughts and speech which can reinforce bad behaviors, disease or illness, and keep anyone from changing for the better. I’ll prove that such upbeat and positive language isn’t new to you! Haven’t you already said to a cat “You are a good boy” or “You are a good girl” even if they might not always be? By using the right words, you are saying that something already is a fact or reality. It’s encouraging for all parties involved, these words are easy for the body and mind to grasp. When we make a wish, like “I wish my cats my cats to get along” the words are vague and imply that it may never happen. Instead say: “My cats are getting along!” “My cats are responding well to the flower essences.” These say it’s reality and not a day dream! Here are a few phrases you can easily use when holding our bottles of flower essence formulas or Convivial House Cat. It only takes a few seconds to think them or say them aloud. Before we tell you about this week’s sale, another habit to change is verbally taking ownership or assigning ownership of disease. What I mean by that is don’t say: “I’m a Diabetic” as it sounds like you’ve joined a club you want to remain a member of. Instead say” I’ve got Diabetes” which implies that it’s something that can/will go away with the right intentions and modalities. The same with your cat. Don’t say ”Fluffy’s Cancer” because sounds like a cherished possession, instead say “Fluffy has Cancer” which says that it can/will be temporary and go away. Does all of this positivity seem daunting or something difficult to maintain? With today’s determination and effort, tomorrow will be easier and better which is what matters. Remember this old expression: Fake it till you make it! Two cats who healed deeply from our flower essences, crystals and cat beds! We have an inspiring tale of deep healing to tell you about. Two cats, Fiona and Sunnybelle, like all cats, sensed that Mary their human Cat-Mother was in severe pain, but these two empathic cats reacted in a more extreme way than many cats. Mary was in horrific spinal pain that required surgery which left her in worse condition than before. Her beloved cats reacted: Fiona nearly wasted away and could have died from grief and worry while Sunnybelle was so distraught that she licked and bit off her fur. Using Cat Faeries flower essences, carved Amethyst crystal cats, and a few of our soft comfy beds both cats bounced back! And with great relief we can report that Cat-Mom Mary is also doing better. This is their story. I have the most fascinating story to tell you about the cat beds, the Amethyst carved cats and your flower essences. Fiona was at death’s door at the end of last Summer. I had been in the hospital for spinal surgeries twice in the previous year, and this stressed her out extremely. Then, I had to go for a spinal cord rehab for a month afterwards. Like so many cats, Fiona is an empath and can feel my pain. She weighed 13 pounds in August 2016 which is an ideal weight. When I had my second spinal cord surgery in October 2017 her weight went down to 11 pounds. Unfortunately, one of the screws that they placed in my low back broke and fractured my tail-bone, so I came back home in worse condition than when I went in. I would scream or cry when I sat down on a raised toilet seat. Fiona never left my side. She would lay on the pillow next to me purring with her whole heart, but I could hear her heartbeat rapidly and irregularly and pounding, from worry about me. A friend took her to the vet because I couldn’t drive. We learned that her weight had dropped down to 10 pounds in one month! That is extremely serious. Remember that Karen Carpenter died of a heart attack from anorexia, and I don’t know the equivalent of losing that amount of body weight percentage wise for a cat, but I knew that Fiona was in deep trouble. I stayed up with her 24/7 because she could only eat small amounts of food every 2 to 4 hours just like a sick baby. When I stroked her, I could feel her bones. I gave her baby food for the added protein and fat which she needed. 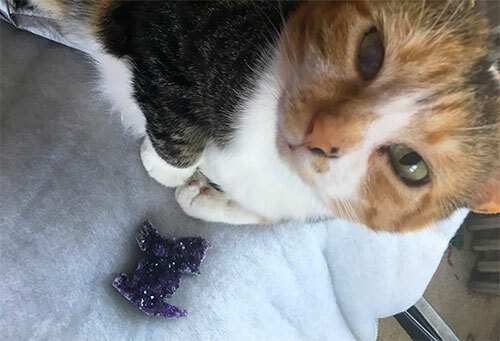 I had purchased a few Cat Faeries carved Amethyst crystal cats for my cats and my daughters cats (who I call my grandchildren!) and I placed one of the Amethyst cats in Fiona’s Cat Faeries bed. Both Sunnybelle and Fiona absolutely love those beds and I have adorable photos of them sleeping side-by-side by their Christmas tree in their new beds. Both cats were very stressed over my illness and they are my nurses who normally sleep with me, but they honestly needed some respite, so I put them in their Cat Faeries beds. When I placed one of the Amethyst cats in Fiona’s new green bed she immediately went over to it and kissed it! During the same time that Fiona was wasting away Sunnybelle licked all the fur off both sides she gave herself a mohawk haircut. Again, I took her to the vet, changed her diet, changed the type of cat litter we used. She got prednisone pills and prednisone shots, but nothing worked. I started to give her your flower essences on top of the crystals. I was using two Cat Faeries formulas for cats: Emotional Sunshine, Calm and Serene, and several of the single essences including: Buttercup, Blue Eyed Grass, Buddha’s Hands, Catnip, Dracula Orchid, and Borage. Fiona finally turned the corner a few days after Christmas and her weight went back up to 11 pounds. She is now at 12 pounds and thriving. Sunnybelle has her beautiful calico fur back thanks to Cat Faeries. How a crystal grid can correct your cat’s behavior! 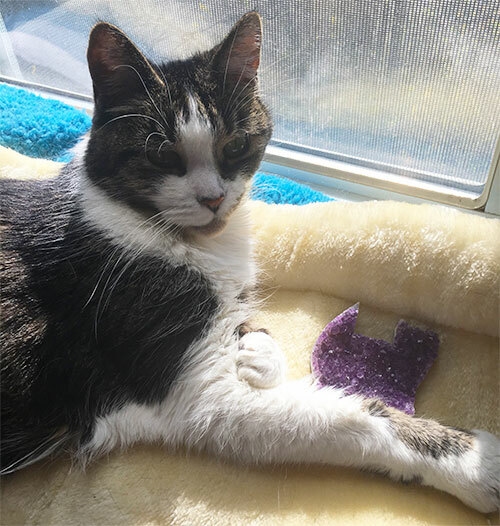 Our offering of Healer’s Crystals is an assortment of 8 different crystals which you can use to correct your cat’s behavior as well as work on yourself and others. In this selection you’ll receive one Amethyst carved cat, one Amethyst cat face, one Larimar heart along with an assortment of several of each of the other 5 crystals. We weigh out 100 grams which is the weight of the crystals pictured here and on our website. We thought we’d tell you about a few of them. Larimar, carved as a heart ~ An emotional cleanser for calming, cooling, and soothing to the emotional body and mind. Activates clear but peaceful communication (sometimes called non-violent communication). Gives emotional strength & access to the divine feminine within. Release yourself from harmful inner bonds to others or to their principals which do not serve you. Promotes serenity and wisdom. Calms excessive fear and diffuses excessive anger. Lovely pale blue color evokes happiness and friendliness. Ideal for cats (and people) who are “testy” or cranky and prone to hissing and growling, and who are not getting along with others. Amethyst ~ For protection, purification and Divine connection. It will assist one in releasing bad behaviors, indulgences or addictions. It holds the same vibration as the Violet Flame which one can call upon for protection from any sort of negativity. It can also purge painful and negative Karmic chords, illness and kinks in the DNA, cells and genes – we are seeing more and more books and articles discussing how we are not slaves to or bound to our genes and genetic traits. It’s exciting to know that Amethyst can help anyone, cat or human to be free of what was once thought to be fixed, predetermined and unchangeable. Amethyst creates the feeling of being a bubble of Light. Activate your higher mind your body’s own ability to purify, cleanse, release and regenerate. Ours are carved into the shape of a cat and a cat’s face. Angel Aura ~ A product of modern technology when elements such as gold are permanently bonded to quartz which actually amplifies the quartz and takes it in new healing and beneficial directions. The pale and pastel shimmer reminds one of Angels or Angel wings while it evokes a bubble of peace, tranquility and contentment feelings which are vital for any sort of healing to any of the body’s systems. Deep awareness and connection to the Angelic realm for heightened purification, rest and repose. Angel Aura loves working with other crystals. Aqua Aura ~ Works in great harmony with Larimar, Amethyst and Angel Aura. Aqua Aura is similar in the technology process and has benefits similar to Angel Aura with the addition of the ability to release negative energies from one’s energy field, to bring inner peace and safety and to release from stress. This alchemical stone strengthens the thymus gland for better immunity. It offers protection from parasites, psychic attack, psychological attack such a gas-lighting, and it can repel malevolent beings. A single crystal programmed with intention is great, but let’s elevate your crystal work to another level! If you create a crystal grid or a formation the stones they will work together and are stronger. With intention you set a goal and intensify the action of the crystals as well as program the crystals, so they know exactly how to be of benefit. This photograph is one way to arrange your crystals. But you can get creative – this is YOUR grid! 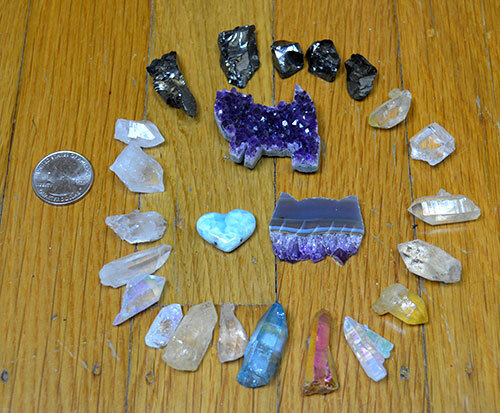 As you can see we arranged the same type of crystals together in a circle with the Amethyst cats and cat faces and Larimar heart in the center. Circles with something in the center is great and so is arranging them in a spiral. You can variegate the colors rather than keep like colors and crystal types together. Notice that the points are facing inwards (except for one – oopsie!) If any of your crystals don’t have a defined point, that’s ok, face it in the direction that feels right. As you are giving them their bath think about your intention which is what you might like the purpose of the grid to be, where you’ll set it up and how you might like it to look. Spiral or circle are two ways. Continuing with thinking about your “Intention” know that it is what empowers your stones. It’s part of programming your crystals. Grids like to be in the presence of crystal clusters of any kind so if you have any place them nearby. Grids also like bowls of sea salt, flowers, candles, incense, an orange or another piece of fruit, and an open bottle of an essential oil. Once your grid is arranged admire its beauty and say words of thanks and gratitude. As you pass the grid during the day sing to it, play music, and remind it and yourself of the intention. How long will this grid be active? That’s up to you! It could be a few weeks, months or it could be permanent. To use the same crystals for another grid with a different intention cleans them under cold running water. We recommend that after cleansing that you set them in the sun in a copper vessel during the hours of 9am and 11am to energize them. The heat of direct Noontime sun could cause cracking. As you collect more crystals you can add to your grid. Yes, you can have more than one grid in your home each with its own intention/purpose. Suggestions for phrases to correct your cat’s not so pleasant behaviors. We added the last two are for your consideration for people. Select one phrase or create your own. Swap out “my cat” with the name(s) of the cat or cats (or person). Be creative. Every cat or person is unique so tailor your words as it feels right. My cat is calm and will no longer spray urine in the house, I ask that the crystals help, thank you. My cat will no longer fight with the other cats, I ask that the crystals help, thank you. 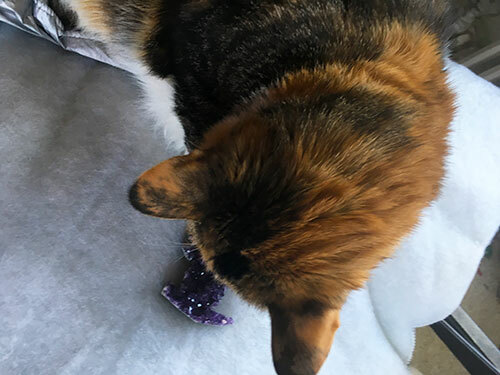 My cat will no longer bully another cat, I ask that the crystals help, thank you. 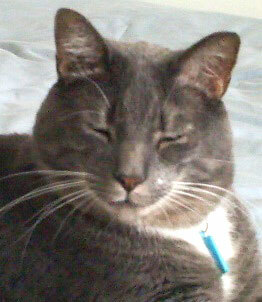 My cat will be accepting of _____name____ and be kind towards ____name____, I ask that the crystals help, thank you. My will enjoy using a litter box rather than the floor, I ask that the crystals help, thank you. My cat’s cells will cleanse daily, that DNA will be strong for a disease-free body, I ask that the crystals help, thank you. My child will realize that studying and reading are beneficial, I ask that the crystals help, thank you. I am at peace so that my cells cleanse daily, that my DNA is strong and healthy, and that my telomeres are the ideal length, I ask that the crystals help, thank you. Note! Is the word “telomeres” a new one for you? If it is, you are going to love reading this book: “The Telomere Effect” by Elizabeth Blackburn. Call your local bookstore and if they don’t have it they will order it. It’s life changing and gives you a whole new perspective about taking your health into your own hands – and into your daily thoughts and actions! It’s one of the most important books that you will ever read.